One of the most exciting developments at WSDC was the inception of our Research and Volunteer Institute, which we started a year ago. We set this up to focus on marine conservation, education and awareness, with the most pressing priority being the protection and preservation of the Great White Shark. 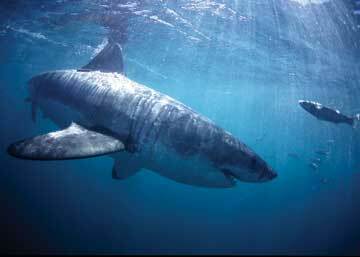 The White Shark is an apex predator, meaning that it is at the top of the food chain and contributes greatly to maintaining the balance of species that is so vital to the health of our oceans. However, there are thought to be only two to three thousand of these marine giants left on the planet. The Western Cape is home to one of the densest shark populations on the planet, yet even here only around 300 to 500 remain, according to a recent study spearheaded by the Shark Specialist Unit at the University of Stellenbosch. These numbers represent a critical mass – the great white shark is dangerously close to extinction, both locally and globally. Never before have conservation efforts to sustain these populations been so important and this pressing issue, along with our passion for sharks and the sea, were the driving forces behind the establishment of our Research and Volunteer Institute. Our team of researchers works alongside volunteers from all over the world, gathering much-needed data on Great Whites, as well other sharks along the Western Cape coast and the marine and coastal environment as a whole. Our volunteer programme offers a unique opportunity to get involved with meaningful and groundbreaking shark studies in the Great White Shark capital of the world. There are also ample opportunities to cage dive with Great Whites. Monitoring and building a database of the Great White Shark population in Gansbaai using dorsal fin identification techniques developed by Dr Sara Andreotti, a leading shark scientist. We will ultimately use this data for a comparative study to get a clearer idea of exact numbers of sharks left along our coastline. Studying and tagging a variety of other local shark species, which we know relatively little about and are an important food source for Great Whites. We tagged 180 of these sharks over 6 months last year, including Dark Shysharks, Puffadder Shysharks, Leopard Catsharks, Pyjama Catsharks, Smoothhounds, Spiny dogfish, Soupfin Sharks, Spotted Gully Sharks and Bronze Whalers. We are very excited to continue tagging and recapture our tagged sharks in order to establish baseline data about the diversity, abundance and habitat use of these species. We are also assessing the health of these populations and trying to determine how they might be affected by local fishing practices. We are adopting a holistic approach to try and build a bigger picture of what is going on in our bay, and how this could be directly or indirectly affecting the Great White Shark population. Organising coastal clean-ups in the Overstrand region. Working with local communities and learners – including Pearly Beach Conservation and Gansbaai Academia Marine Science Club to raise awareness about sharks and marine conservation. Educating local fishermen about sustainable marine practices. Running a Social Perception Study to determine the influence the cage-diving industry can have on changing the misconceptions that people have about these incredible animals.